A glass lump doesn’t make a pyramid! Despite the lack of excavation authorization on Visocica Hill, Mr. Osmanagic’s Foundation is continuing its activities, during this 2007 spring, on the unprotected sites, Pljesevica Hill and the two tunnels of Ravne and KTK (according to the name of the company that owns the place where this second tunnel opens); activities which permit it to announce regularly new discoveries, always wonderful and conclusive. So one could witness, during the month of May, a profusion of new "artifacts"; some have a taste of "déjà vu", particularly the sandstone blocks that have multiplied in Ravne tunnel: an egg-shaped sandstone block "possibly showing the landscape of Visoko valley", or, near it, another block (bs) that "will remain at the same location for further archaeological analysis". 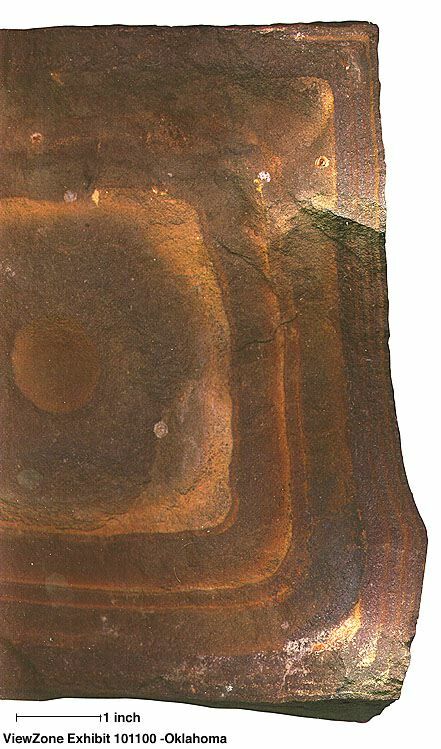 According to the geologist Paul Heinrich, the stones found on Pljesevica are a quite classical instance of the superposition of a "groove mark" (the linear feature, or, rather, the "cast" of it as it was preserved at the basis of the upper bedding of sandstone) and of "flute casts" (the little marks which radiate from the linear main mark); and the whole was probably slightly distorted by the load of sand that covered the mudddy lower bedding and filled the marks. The above photographs come, for the first three, from a site in the Tennessee, and for the last three from Oklahoma. This kind of spectacular structure often raise up "pseudo-archaeological" interpretations - M. Osmanagic invented nothing: in the Tennessee (en), they are said to be a kind of "secret code" made by ancient Indians or aliens; in Oklahoma (en), a "phoenician furnace" . studied by Glen J. Kuban (en). Doesn’t it remind you of this magnificent "footprint" (en) found on Pljesevica? the lacks of "reaction to the acids" does not mean a lot without further informations: every metal does not react to every acid, a variation in the dilution of the acid and in the quantity of metal and acid can produce very different effects. Knowing that the Foundation is used to distort every scientific result, I would like to be sure that "the laboratory analyses" made on this stone have been more than just throwing a few drops of diluted chlorhydric acid, or even of vinegar, sufficient to produce a reaction with the stone carbonates but not with the metal! The Foundation is right, in that they have, for once, talked of "potential artifacts"! However, he gives absolutely no information about its origin and the place it was found; the entire text is a long lament about the blindness and the wickedness of the "scientists and ministers" opposing Mr. Osmanagic, and he just hints that the stone must have been re-used a number of times, and that it comes from a "ruined object". On the bosnian-pyramid.com forum, it is said (en) that it comes from "inside the Visoko valley", a valley that is quite large. Of what is this stone, that may come from a medieval building, evidence? Of absolutely nothing pertaining to pyramids. But its publication evidently shows the "propaganda" technique used by Mr. Osmanagic and his Foundation: they try to convince the public that "there is something" in Visoko valley by making what Paul Heinrich has called a "chimera", that is by creating a whole pseudo-archaeological construction, using at the same time the fascinating geology of the region and elements of real archaeology distorted and diverted in pieces of their puzzle. That is also Stultitia’s analysis of the show (bs) Mr. Osmanagic made for the Bosnian federal TV: by a montage alternating every few minutes or seconds images of Bosnia (spheres, "pyramids", tunnels...) and images of real sites in Latin America or Egypt, the aim is to "shuffle the cards", to make the public, in an almost subliminal way, confuse and liken Mr. Osmanagic’s fantasy archaeology with real archaeology. Thus this mixing, on the Foundation website, of real, false, and potential artifacts, with the same aim of "shuffling the cards". As there is no scale on the photographs, it’s impossible to estimate the size of the pieces. Stultitia has indeed noted numerous similarities (bs) between the ways of David Campbell, the Oklahoma pseudo-archaeologist, and the ones of Mr. Osmanagic... including the hat, that seems to be an obligatory device for these "specialists"!